So unfortunately, a woman will do anything for her. Even lives will be at stake if it is the only way that can be done. 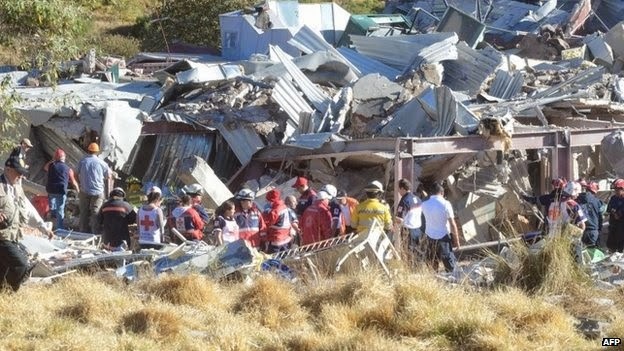 A miracle, nine infants were found alive when the gas explosion incident at the maternity hospital in Mexico. However, many of the baby's mother who becomes a victim, as it seeks to protect the baby. As reported by dailymail.co.uk , a fuel tank of gas leak, explode in Cuajimalpa, Mexico, 01.29.2015, this incident destroy a maternity hospital. Nine babies, is currently undergoing DNA testing. This test is done in an effort to reunite the poor babies with their parents. The incident killed three people. They are a nurse, small children and babies. While 70 others were seriously injured. Nine of this baby, just born a few hours before the explosion occurred. The baby is rescued from the rubble and debris. President of Mexico, Enrique Pena Nieto and his wife Angelica Rivera visited the victims in a nearby hospital, they said that if the babies survived, as protected by their mother's body. These mothers, do not think of themselves, which is essential newborn baby survived. With all the efforts, this true mothers protect their babies, by making the body as a protective shield. Nine babies do not have a bracelet, because it may be damaged, when the blast occurred. Thus, DNA testing is needed to find out who the baby's parents. Company's gas tank explosion causes this to happen, has been operating in Mexico for seven years.The driver of the truck carrying the tank has been arrested along with his two assistants. Armando Ahued, the city's health secretary said that, to date there are a total of 21 infants were injured, nine of whom suffered serious injuries and seven adults experiencing serious injury. Rescue workers had to break through the concrete hospital to evacuate. Most of the victims injured by broken glass. The explosion led to the formation of large gas clouds, then. The occupants of the hospital is panic, because they can not get out of the ruins. From a total of 70 victims, including women who risked their lives to protect her baby. Agustin Herrera, an anesthetic officer, saw the mother who was seriously injured trying to walk out carrying their babies. There were 110 people who were in the hospital room 35, when the blast occurred. Part hospital most severe damage was neonatology. Neonatology is a treatment room, treatment, monitoring, and medical intervention for newborns at high risk. An exploding gas or liquid propane LPG which is highly explosive. People who were injured were evacuated by helicopter to a hospital. The hospital was established in 1993, located in the lower middle-class citizens, densely populated. In addition to the hospital, also stood a school that has a lot of students are children. May God protect and give strength and peace for the victims of the explosion at the Hospital Cuajimalpa, Mexico and his family.